With weekly deliversies worldwide, buy the original Queen Anne chair today. Simply call our sales team on +44 (0)1484 663294 or email info@wing-chairs.com with your questions. For a free full colour brochure and up to five samples of high quality leathers simply visit our brochure request page. Prices vary based on shipping costs. Please call us for details. The Queen Anne chair is available in a wide selection of fabric and leather styles and colours. Please visit our fabric and leather swatch page for details. Alternatively, should you require something to match your decor, ask about upholstering your chair with the fabric of your choice. 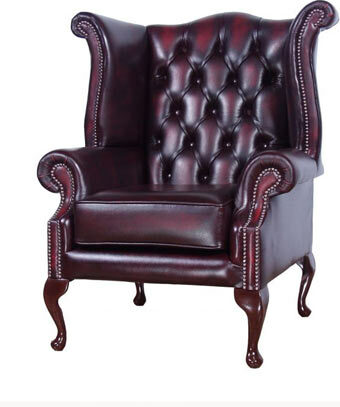 The original Queen Anne wing chair a fantastic example of the original wing chair. Handcrafted to order using original designs that have been modernised to meet up-to-date safety standards at our workshops in the UK, the Queen Anne chair is constructed from the finest materials and upholstered in high quality, full-hide leathers or fabrics and finished with a deep filled cushioned seat. Need the Queen Anne chair tailored to your requirements. Ask about our bespoke furniture customisation services.